If you’re looking to buy or sell a home in the Conejo Valley then you’re going to want to hire a qualified Conejo Valley Real Estate Agent. Locating an agent is simple but hiring a qualified agent with experience that will protect your interests should be something you take very seriously. An inexperienced agent can cost a buyer or seller thousands and may likely end up in potential litigation if your’re not careful. Hiring a local agent with knowledge of the area and market trends will help buyers choose the right home and sellers make the right decisions when selling. When it comes to choosing a local Realtor, makes sure to do your homework so you know what to expect. Buying a home in the Conejo Valley can be a very exciting time for a buyer and why shouldn’t it be, after all the Conejo Valley offers some of the best cities to live in such as Agoura Hills, Oak Park, Westlake Village, Thousand Oaks and Newbury Park. 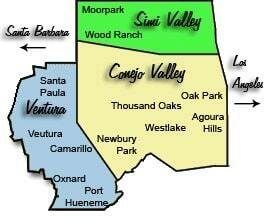 In addition, we have some great surrounding communities also such as Camarillo, Simi Valley and Moorpark. The combination of great weather, highly rated schools and consistent ranking in the US of safest cities makes buying a home in the Conejo Valley a safe bet! Of course buying a home in any of the amazing cities that Conejo Valley offers is a wonderful opportunity but as a buyer you need to be aware of the pitfalls that can come with buying a home regardless of the location. While the process of buying a home doesn’t much change, the paperwork and disclosure process certainly does. For instance, did you know that buying a home in the Conejo Valley area might be very different than buying a home in a nearby city such as Moorpark CA or Simi Valley CA? California Association of Realtors forms such as the Sellers Property Questionnaire (SPQ) and the Transfer Disclosure Statement (TDS) are forms a seller completes to make a buyer aware of what issues if any are present with the home. Additionally the Natural Hazard Disclosure (NHD) is a report typically paid for by the seller and delivered from escrow to the buyer and seller that discloses all environmental aspects of the property. Items such as earthquake fault zones, flood zones and liquification areas are just come of the items covered in this report. Agents should never take it upon themselves to explain seller disclosures to their clients. It’s a buyers responsibility to look over all paperwork and disclosures provided by the seller but if you have questions that’s where your agent will be able to assist and get further clarification from the seller or listing agent. Never rely on your Conejo Valley Real Estate Agent to advise you of seller disclosures. Selling a home in the Conejo Valley can be very rewarding. Homes in the area when priced appropriately sell fairly quickly and typically for not much off their original asking price providing the home is priced appropriately. As I write this article in early April 2019 we’re in the beginning of the busy selling season. Traditionally the real estate “busy season” is from March through September but we’ve been in a steady sellers market since February 2018. Some of the paperwork reference above like the SPQ and TDS are disclosures that a seller must complete. Sellers must answer all questions on these forms and any others truthfully and explain as necessary. Failure to accurately complete these forms can cause a seller much grief in the end in the form of lawsuits from non-disclosures. As a general rule of thumb, disclose, disclose, disclose! Whether you’re buying or selling a home in the Conejo Valley you’ll want an experienced, professional agent to assist you. When you’re buying a home an agent can assist with showing you homes based on your buying criteria, negotiation of offers when you find the perfect home and the transaction process after you get the offer accepted. For many experienced agents, assisting Buyers through a real estate transaction is fairly simple as the process doesn’t change very much from deal to deal. All in all, the general process is the same but can vary slightly with each Buyer and Seller trying to get something out of the other. It’s nice to have an agent on your side to buffer through this process which helps a client not make emotional decisions. For the deals that are tougher you’ll appreciate having a representative on your side that you don’t have to pay for! That’s right, as a buyer you don’t pay anything for an agent to represent you. As a Seller, you’ll appreciate the guidance skilled professionals like my team and I offer. When it comes to listing your home for sale we’ll carefully evaluate your home, what can be done to maximize the profits of the home sale and protect you through sound advice as we go through the selling process together. The first step in selling a home in the Conejo Valley is hiring a Conejo Valley Real Estate Agent. Once you’ve selected an agent that you’d like to work with you’ll want to evaluate your home and prepare it for the market. Carefully walk through and discuss any items that need repair, additionally as a seller you’ll want to consider inexpensive cosmetic fixes that may not necessarily increase the value of the home but will increase the marketability. If you’d like to know more about the differences between repairs that will generate return on investment or return on marketability, please feel free reach out to us anytime. Before you can list your home you need to be aware of it’s value. One of the many areas we excel in is our valuation accuracy, in fact our valuation price to sales price only typically varies by a 2.0% average. Let’s face it, you as the seller can list your home for sale at whatever price you want but it really helps to have an accurate valuation so you know what your base line is. In the end, listing a home on the market and listing your home to sell can be two very different things. One of the easiest and biggest mistakes to avoid is listing a home for too much money. Listing for less than market value can leave money on the table as well but the truth is you have a better chance of a pricing error correction on listing two low as multiple offers will come in and the negotiation process will correct itself. Be that as it may, listing a home for much higher than it’s fair market value will end up costing you money in the end. Listing too high will result in multiple price reductions and your home may even possibly sell at a price less than fair market value if it’s stuck on the market for too long. Once you and your agent have come to a list price that is feasible and all work if any is completed then you’re ready to list your home to sell. Assuming your home is now “market ready” then your Conejo Valley Real Estate Agent will list your home to sell. This is part 1 of 2 that requires a lot of hands on work from your agent. Some sellers believe marketing a home is magical and that an agent just waves a wand and everything falls into place… I wish that were the case! Trust me, it’s not like that at all, there’s a lot of planning, content development, creativity, expenses and scheduling to execute a SUCCESSFUL marketing plan. Colin Powell once said “There are no secrets to success. It is the result of preparation, hard work, and learning from failure.“ Having successfully sold and closed escrow on more than 1,000 properties I’ve seen both successes and failures. It’s this experience and know how that sets me apart as your trusted Conejo Valley Real Estate Agent to plan, implement and execute a successful home-selling campaign. Through my preparation, hard work and experience I promise to be your best resource in getting your home sold quickly and for top-dollar! In addition to all the marketing during the sale process your Conejo Valley Real Estate Agent will also be scheduling showings with buyers they have as well as agents from other companies and their buyers plus talking up your property to other local real estate brokerages. Buyers don’t always come through a listing agent, in fact most often than not a Buyers Agent will bring their Buyer to the property which will result in the sale. This is the exact reason I like to market the home not just to Buyers but also to other agents in the area. It’s always a good idea to send an email out to all agents in the local market introducing the property via email once listed. I usually do this within a day of the property being listed so I can also invite the agents and encourage them to bring their buyers to a recently scheduled open house. Your trusted agent will also be assisting through the scheduling process for showings. Some agents choose to put their Seller’s names in the showing instructions of the MLS and encourage agents to call the seller direct to make the appointment but I like to handle the scheduling for my clients. This give me another opportunity to reach out and speak with an agent that showed the property and inquire about feedback from their buyers. Feedback on the home from a potential buyer is absolutely valuable and helps both the listing agent and their sellers navigate through the marketing process. Think that’s all it takes to sell a home? Not quite, we’re just getting started! In addition to your Conejo Valley Real Estate Agent advertising and marketing your home “off-line” to their buyers and other agents they’ll also be marketing the home online. With 90% of buyer searching homes for sale on the internet you’ll want to make sure your home will be advertised heavily online. The online major real estate websites are Zillow, RedFin, Trulia and Realtor.com and you’ll want to make sure your Conejo Valley home is listed for sale on every one! While we’re on the subject of marketing online, it’s important to point out the fact that your property posting on the major websites need to look extra sharp with photos that pop. This means, high resolution photography from a professional photographer. The web, more specifically search engines and everyone browsing it love media, why do you think instagram is so popular? Make sure your online for sale posting also includes video. Potential buyers browsing the internet for Conejo Valley homes for sale will stop and look at video and typically spend more time on a property than one that doesn’t. Take the extra effort to try and capture as many buyers eyes as you can. Be aware, some agents will charge for upgraded listing options like these, luckily for our clients selling Conejo Valley Homes we include both high resolution photography and video at no charge because we believe in selling our clients home for top dollar and within the amount of time they need to achieve their real estate goals. For more information on what all we provide to our listing clients looking to sell their homes, please contact us directly. Now that the advertising and marketing has paid off we’ll discuss the next steps. Congratulations, you’ve received an offer, now what? Well, here is where part 2 of 2 of your Conejo Valley Real Estate Agent’s hands on process begins. Receiving an offer is great but what do you do with it? How you as the seller responds will greatly depend on what that offer looks like in terms of price, closing date, financing and many other factors. While you go through the negotiation process it’s important to keep a cool head and remember you’re not done negotiating until the transaction is closed. Buyers have due diligence periods which will cover in a bit but during all these times you as the seller may be presented with items you need to further negotiate. The art of negotiation is something that takes a while to perfect and it’s not something that can be learned simply by selling a couple houses. As a skilled agent that has dealt with thousands of clients and agents I can assure you that the ability to be able to read people both in-person and not is a must. Kwame Christian Esq. mentions in his podcast that when negotiating something you need to be be aware of how the person is responding, things such as their body language (in-person) and there breath pattern (phone) will help a person negotiate effectively. Real estate is a people business and buying or selling a home can be an emotional transaction, at the end of the day we’re all human. Always remember through the offer and transaction process that when you’re presented with decisions that need to be made, talk with your agent and make sure to discuss all options, variables and outcomes and never make hasty, emotional decisions. As we press on through successful negotiation of the California Residential Purchase Agreement we will end up at the beginning of a real estate transaction, formally called an Escrow. This is where your Conejo Valley Real Estate Agent will really show their skill-set. In the beginning of the escrow process your agent will work with the other agent to schedule buyer requested inspections and send over any disclosure paperwork related to the property. As a seller, you’re obligated to allow the buyer reasonable access to the property within the agreed upon inspection period which unless otherwise stated is 17 days after acceptance. Disclosures and other property related reports must be delivered to the buyer or buyers agent within 7 days of acceptance. It’s important to adhere to these guidelines so that when the deadlines expire, your Conejo Valley Real Estate Agent can request appropriate contingency removals to keep the transaction moving forward. Once all inspections are completed, the buyers real estate agent may submit a Buyers Repair Request. This is a California Association of Realtors form that formally requests the items of buyers concern and stipulates the action that the buyer wishes the seller to take. As a seller, you have a couple options; you can approve all requested repairs, negotiate some repairs, decline all repairs or simply not respond. Not responding sounds strange right? It’s true you as a seller have a right not to respond as per Section 14B(2) of the California Purchase Agreement which states; Within the time specified in paragraph 14B(1), Buyer may request that Seller make repairs or take any other action regarding the Property (C.A.R. Form RR). Seller has no obligation to agree to or respond to (C.A.R. Form RRRR) Buyer’s requests. Having a Conejo Valley Real Estate Agent that knows the state purchase contract well will benefit you greatly so you as a Buyer or Seller have the information and are educated throughout the process. After buyer and seller dialogue has completed on the repair request process then you as the seller should confirm with your agent that the buyer has removed applicable contingencies. The only outstanding contingency at this point should be the Loan Contingency which buyer has 21 days from acceptance unless otherwise stipulated. Let’s fast forward a bit and consider all contingencies have been removed. At this point a seller is as solid as they can be for their deal to complete. Of course there are never any guarantees but a buyer with no contingencies remaining is as solid as you can get prior to the actual close of escrow taking place. Now you have some basic knowledge on what the benefits are and what an agent like me can do for you but what do you do to find the right agent? Let’s talk about what not to do first; never, ever, ever hire a family member, friend or anyone else that has their real estate license but is not in the business full time. You really don’t want to entrust a large transaction like buying or selling a home to someone that just does real estate “on the side”. I would encourage you to do your own research on a couple agents before reaching out to those around you asking for their opinions. Let’s face it, everyone has an opinion and will gladly offers there’s but in the end if something goes wrong your friend that gave you the recommendation probably won’t offer much support to get you out of trouble. 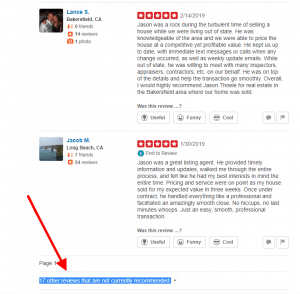 To begin finding a good Conejo Valley Realtor, I would recommend starting on Yelp!. Yelp’s reviews are actively moderated and the reviews showing today may not show up tomorrow and vise-versa due to Yelps algorithms. Make sure to look through each agents profile carefully as Yelp! may filter out (as shown in the photo to the right with the red arrow) reviews with their algorithm that shouldn’t be filtered. Additionally, the label they impose as “other reviews that are not currently recommended” can be misleading to a viewer because it’s not that the reviews are negative but rather that Yelp won’t count them in their star rating as specified in the following text/link “Note: The reviews below are not factored into the business’s overall star rating.” which shows additional 5 star reviews from legitimate users. After you get five or so agents names from Yelp! with four star or better ratings then further investigate them. Do a Google Search based on the Realtors name such as my name “Jason Thoele” and see what comes up. As you’ll see by clicking the following link; https://www.google.com/search?q=jason+thoele agents with longevity in the real estate business will have many, even thousands of pages about them. Make sure you pay attention and visit all the items on the first page of your search as those items will be the most relevant and important. Pay special attention to sites like Zillow, Yelp, Realtor.com and Trulia (Trulia was recently acquired by Zillow so data will be the same) as these pages will contain information on the agent such as additional reviews and will help you in your search by zeroing in on the perfect agent. After you have your Realtor name list limited down to 2 or 3 Conejo Valley Real Estate Agents then you’ll want to setup times to meet with each agent personally to conduct some interviews and offer a home tour so the agent can see your home. After you’ve meet the agents personally you’ll likely have an idea then who you’d like to work with and you’ll be best suited to hire a great agent that will do a good job and will match with your personality. For more information on finding the perfect Conejo Valley Real Estate Agent to assist you or if you have any other questions relating to buying or selling a home, please contact us. Additionally, please feel free to submit a comment below.